70 PaperCity Presents THE PRODUCED BY CHRISTINA GEYER. PORTRAITS SAMANTHA JANE FOR SISTERBROTHER MGMT. STYLING CARLOS ALONSO PARADA FOR SEAMINX ARTIST MANAGEMENT. HAIR, MAKEUP, AND GROOMING AL TIDWELL FOR KIM DAWSON AGENCY. THEY ARE ENTREPRENEURS AND ART PATRONS, EXECUTIVES AND SERIOUS PHILANTHROPISTS — AND ALL EFFECT CHANGE IN OUR CITY IN A PERSONAL WAY. 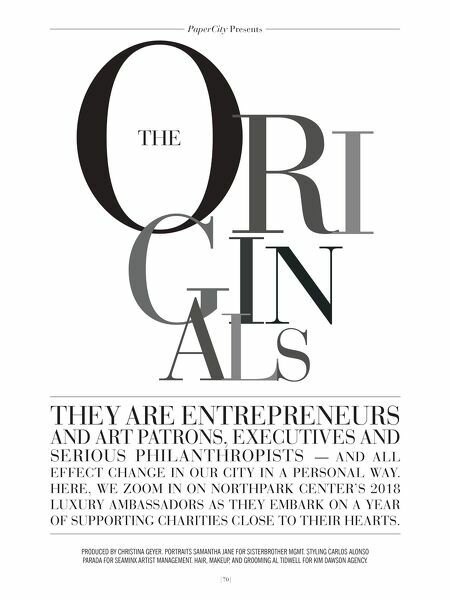 HERE, WE ZOOM IN ON NORTHPARK CENTER'S 2018 LUXURY AMBASSADORS AS THEY EMBARK ON A YEAR OF SUPPORTING CHARITIES CLOSE TO THEIR HEARTS.